Stopping climate change requires action at all levels of society, including to create an economic structure (regulation, taxes and incentives) that helps to protect our planet as well as all the people who share it. The United Nations is leading global action, but can be limited by how much change the world’s governments allow. We need to let world leaders know of our support for climate action and to press them to put policies in place that will control climate change and prevent it’s worst consequences. Avaaz – A global web movement to bring people-powered politics to decision-making everywhere, with many campaigns including on climate. 38 Degrees – One of the UK’s biggest campaigning communities working to bring about real change in the UK by taking action on the issues that we all care about, including climate change. 10:10 – Positive, practical projects focused on tackling climate change at the community level, and turning these local actions into a force for bigger changes. CAFOD – Catholic aid agency that is also campaigning to prevent climate change pushing people deeper into poverty and to support the transition from polluting fossil fuels to sustainable energy for all. Campaign against Climate Change – Bringing people together to push for the urgent and resolute action needed to prevent the catastrophic destabilisation of global climate. Carbon Tracker Initiative – A not for profit financial think tank aimed at enabling a climate secure global energy market by aligning capital market actions with climate reality. Christian Aid – Working towards an end to poverty, including to build a safe, clean future and to stand against the greed and wastefulness that fuel climate change. 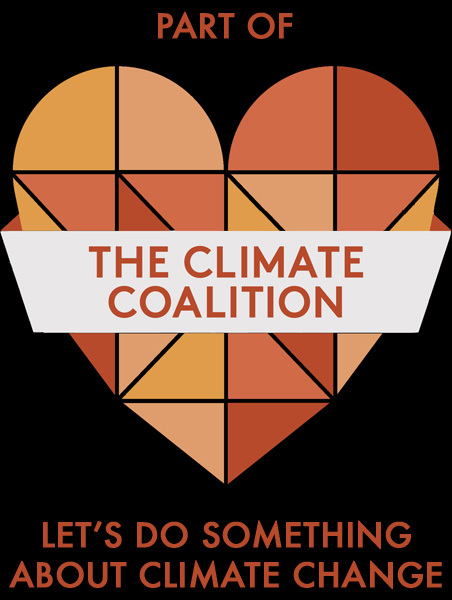 The Climate Coalition – The UK’s largest group dedicated to action on climate change and limiting its impact on the world’s poorest communities. Extinction Rebellion – This is a campaign by the Rising Up network, which involves mass civil disobedience and aims to promote a fundamental change of our political and economic system to one which maximises well-being and minimises harm. Forum for the Future – An independent non-profit working globally with business, government and other organisations to solve complex sustainability challenges. Fossil Free UK – Part of an an international divestment movement calling for organisations, institutions and individuals to demonstrate climate leadership and end their financial support for the fossil fuel industry. Friends of the Earth – Working for a strong global climate agreement, to keep fossil fuels in the ground, to use energy efficiently, for a renewables revolution and to prepare for the climate change we cannot avoid. Greenpeace – Campaigns to stop climate change. RSPB – The UK’s biggest nature conservation charity also lobbies for new climate polices, helps their nature reserves cope with the effects and publishes information on climate change. Operation Noah – An ecumenical Christian charity providing leadership, focus and inspiration in response to the growing threat of catastrophic climate change. Oxfam – Working to overcome the injustice of poverty, including to reduce the impact of global warming, which is already making things so much harder for poor communities. Sandbag – A campaign to shine a light on what is really going on in carbon emissions trading and push for improvements so that it delivers. Tearfund – Working with local churches to end poverty, including to help poor communities adapt to the impacts of climate change whilst speaking out to reduce global emissions. Transition Network – A charity to inspire, encourage, connect, support and train communities as they self-organise around the Transition model, creating initiatives that rebuild resilience and reduce CO2 emissions. UK Youth Climate Coalition – Working to create a future which is happy, affordable, clean and safe. The Wildlife Trusts – Standing up for and looking after natural and wild places, including by addressing the significant threat of climate change. WWF-UK – Addressing threats to the natural world, including to tackle climate change with governments, communities and businesses, so people can live in harmony with nature. Women’s Institute – The WI provides women with opportunities, including to campaign on issues that matter to them and their communities, such as climate change.